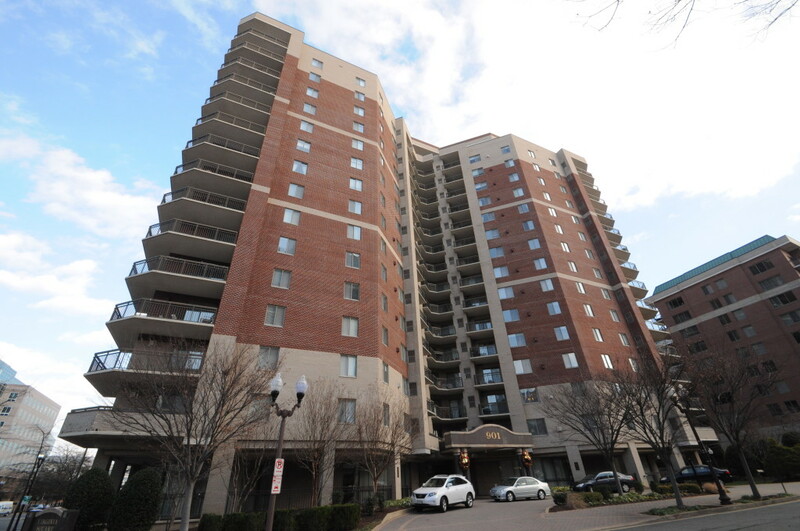 Virginia Square Condominium in 2 sentences: Virginia Square Condominiums is an amenity-rich high-rise located across the street from the Virginia Square Metro. Comprised of one, two, and three-bedroom layouts, condos at VA Square Condo all include a balcony to go along with a smart floor plan that will tend to optimize the condo layouts in the community. Virginia Square Condominium was developed by Dittmar and completed in 1998. Dittmar is a prominent developer in Arlington and actually built the two rental communities that are immediately surrounding Virginia Square Condo. Dittmar built Virginia Square Plaza to the south, and recently finished the brand new (2014) Virginia Square Towers to the east. The condo portion of these Dittmar properties is located at 901 N Monroe Street. The location is perfect for those taking Metro. As you walk out of the lobby of Virginia Square Condo, the first thing that you see is the Metro awning for the Virginia Square Metro Station. The location right along Fairfax Drive is also ideal for those that drive and take I-66, Route 50, and many other main thoroughfares. The community stands 16 stories tall and has 181 residences. The lobby is one of the community’s better assets. It’s significantly bigger than similar condos in Virginia Square, and the lobby level is where the amenities can be found. Virginia Square has quite a few amenities including on-site management, an outdoor pool, guest parking, a community room, a game room, a fitness center, and extra storage. The floor plans are going to range from one to three-bedroom layouts. The floor plans here are “no-frills”, yet smartly-laid out. There are not going to be significant differences between layouts. All floor plans will come with a balcony and a fireplace. The kitchen styles for one and two-bedrooms are usually that of an open galley layout, meaning that it may be a little narrow, but you will have space to include a breakfast bar. The benefit of having this layout is you do get more cabinet space than similar buildings. Once you get into the larger three-bedroom floor plans, you will start to see kitchens get a little bit bigger. However, three-bedroom layouts are a little more rare. In an average year, usually one three bedroom condo for sale at Virginia Square Condo will the market. The best part about the condos at Virginia Square Condominium is that the space is well-utilized inside the condos. The bathrooms in the community are huge! The master bathrooms can be significantly larger than in other communities. One downside is that some condos may feel like it’s still 1998. If you are an owner and are considering putting your Virginia Square Condo for sale, think about upgrading your light fixtures and spending some money to bring your condo up to speed. Of course, this issue could almost mitigated from the buyer’s point-of-view because of the opportunity that the layout provides. This is not a situation where the space is outdated and not functional. The space and potential is there. New buyers may just have to do some work to upgrade kitchens, bathrooms, and fixtures in the living room. This will vary on a unit-by-unit basis, but it is somewhat common to see in the community. Virginia Square Condo has been showing up on more and more buyer’s radar as the community continues to flourish. In 2015, the community recorded its first million-dollar sale when a penthouse condo sold for $1,050,000. Meanwhile, the location is becoming more coveted. Dittmar finished its construction next door on brand new apartments in 2014 while Kettler is planning on opening up Latitude Apartments across the street from Virginia Square Condominiums in 2017. New residences are coming to Virginia Square at a fast pace. As long as Virginia Square Condominium can keep making improvements and sustain the high quality of life that residents enjoy inside the community, Virginia Square Condo will continue to be an excellent residence for renters and owners alike.